Meet the Locals: Crescent Farm | food.heal.thrive. In my search of real food providers, I found a small vegetable farm in Clinton that is certified organic. Being certified organic is a big deal for any farm, but a bigger deal for a small farm. First, it’s costly and second, the growing methods involve much more work than commercial agriculture. I follow several local accounts on Instagram, some of which are restaurants I would gladly dine at, knowing they can work with my food allergies. Chefs post pictures of their local providers and that’s how I found Crescent Farm. One of my Nutritional Therapy class homework is to create a Community Outreach Project. I chose to build a list of local providers of real food, grown the right way. Crescent Farm is a perfect example. All their vegetables are organic, local and in season. I called the farm and asked if I could get a tour. Margie Levine welcomed me with a big smile and her two grand-children trailing after her. She spent close to 40 years in Vermont, where she farmed organically most of her life. We walked through the rows of kale and carrot and we discussed the differences of soil from up north to down south, from a rich black soil to a red clay. It’s different methods, like having raised beds, she tells me, but it works. The bugs are also different but the best advantage in the south is having a longer growing season. What prompted Margie to move down south was her daughter’s first pregnancy; she wanted to be close to her grand-children. She previously farmed for the owner of the land in Clinton and when he left for Georgia, she stayed on, renting the land, creating Crescent Farm with her daughter Holly, her son in law Jon and her two grand children. Crescent Farm sells their produce to Bacon Brothers Public House, Belue Farms, Restaurant 17, Swamp Rabbit Cafe and Grocery and Stella’s Southern Bistro. They also offer a CSA program, which I decided to participate in. CSA stands for Community Supported Agriculture; the farm offers shares in their production in the form of a weekly box full of seasonal vegetables, herbs and flowers. The farmer gets part of the money upfront, which helps economically at the beginning of the season with seeds and equipment among other things. It’s a wonderful model of agriculture, which helps us connect with our farmer and see where our food comes from. 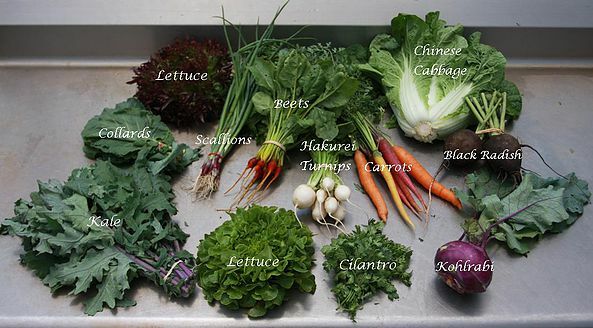 I bought a whole share and I will get freshly picked vegetables each week for 28 weeks. The total comes up to $750.00, which is around $26 dollars a week for a box full of organic produce. It can’t be beat, and Crescent Farms offers the convenience of 3 payments. Local, fresh and organic vegetables are a hop away from Greenwood, and I’m thrilled to have met Margie and visited Crescent Farm. Follow them on Facebook and Instagram, and better yet, visit the farm in person in Clinton. Simply call Margie or Holly, their numbers are on their website.